There are more than 430 public resorts in the US and 190 in Canada. Every Year SKI Magazine ranks the top North American resorts by location based on approximately 13 conditions from snow and terrain quality to service, value and après-ski. For the 2006/07 season, Michigan and Ontario claimed the most ski areas one state or province. Breckenridge, Colorado boasts the highest ski lift in the nation, and Blackcomb and Whistler, Canada triumph with the most vertical rise respectively. Colorado’s Snowmass, Big Sky, Montana and Jackson Hole, Wyoming come in third, fourth and fifth in the vertical category. In North America, the Rocky Mountains offer the steepest terrain and most skiable acres, with variable terrain from above tree-line bowls and cliff bands, to aspen glades and pine cutes. From New Mexico to Alaska, the snowpack varies with latitude and proximity to large water bodies. The high desert part of the range boasts champagne powder, great for snorkel skiing, but too dry for a good base, creating exposed steep chutes. The Sierra Nevada’s in California are slightly smaller than the Rockies, but offer great challenging terrain and often more, though usually wetter, snow. Powder days abound, but Sierra Cement can be a problem. The Northwest’s Cascades are the next range in terms of size. The terrain is less steep but thrives with great tree skiing. The Pacific snowpack makes for good base, but wet heavy powder days, and weeks of Cascade Crud snowpack. The Appalachians are North America’s oldest and most worn down mountain range. The proliferation of ski areas at low altitude have less skiable acreage than the western resorts, but also lack the bravado and ego of that comes with size and challenge. Icy conditions plague eastern tourists, but like all snow conditions, the locals have become masters. The mid-west is not known for its skiing, but many comparatively tiny ski areas are located there. Because North America is so broad, weather patterns like El Nino out west and Nor’easters affect snow averages from year to year. Ski areas near the Great Lakes, and Utah’s Great Salt Lake receive lake effect snow more regularly, and in warm years rain plagues lower mountains. Similar to chasing winter from hemisphere to hemisphere, skiers chase snow from one side of North America to the other. In the ever-growing competition for skier dollars, resorts are constantly upgrading lifts, creating new runs, improving snowmaking and building bigger lodges and condominiums. Though not cheap to visit, high-end resorts make their money off real estate, creating largely developed areas that offer more city-like amenities such as, dance club, wine bars, spas and designer boutiques. Resorts like the Vail Mountains, Aspen, CO, Deer Valley, UT, Tremblant, QC, Whistler/Blackcomb, BC focus on service as much as terrain. Usually in SKI magazine’s top ten resorts, these areas take as much of the work out of skiing as they can, offering everything from ski valets to town-to-mountain gondolas. Medium priced resorts like Killington, VT, Banff, AB and Winter Park, CO offer great services with small town appeal, but lack the fineries of high-end resorts. Local bars offer ambiance rather than glitter and most accommodations are available in town. 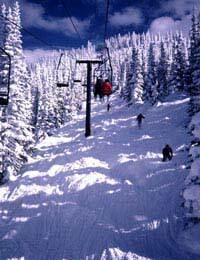 Smaller, family owned resorts like Loveland and Arapahoe Basin, CO, Alta, UT and Wildcat, NH are skier’s mountains. Frequently lacking accommodations of any kind, let alone nightlife, the terrain, snow conditions and short lines are the draw. Ticket prices average $53 across North America, but can be as high as $81 and low as $25 US or Canadian. Adult unlimited season pass prices vary from $200 to $1950 but give skiers access to one or more mountains all season long. Colorado ski areas usually win the race to open first in October, but Mt. Hood, Oregon is often open the longest, offering race camps during summer months. Almost all ski areas offer lessons and children’s ski programs. Mega resorts like Vail run smoothly but deal with outrageous numbers of skiers. Medium sized destination resorts and smaller skier mountains tend to be less intimidating and more kid friendly. Ski areas west of the Mississippi and in Canada generally offer the most backcountry skiing, accessed by lifts, hiking and snow cats. Out east, the famous Tuckerman’s ravine attracts backcountry skiers and partiers, and Canada and Alaska’s abundant big mountain bowls draw helicopter skiing enthusiasts. Silverton, CO is a lift served backcountry-only ski resort and this year, Echo Mountain, a massive terrain-park-only ski area, opened in Colorado. North American mountains deliver terrain and snow conditions for every type of skier. Resorts large and small offer basic on hill amenities, and the more developed the resort, the more on and off snow activities available.